Latin American Working Group (LAWG) - is one of the longest standing coalitions dedicated to foreign policy in the United States. LAWG and its sister organization, the Latin American Working Group Education Fund (LAWGEF), press for US policies that favor human rights, justice, peace and sustainable development throughout Latin America. The Latin American Working Group Education Fund defends the interests of more than 60 religious, humanitarian, and non-governmental organizations before Washington politicians. We are a trusted voice in Congress and we advise legislators who wish to make decisions modelled on human rights. LAWG acts as a coordinator, implementer and catalyst. We bring like-minded partner organizations together to plan and implement effective strategies to influence the policy debate. Please click here to see a list of the organizations the currently participate in the LAWG coalition. We also provide information to activists throughout the United States, so that American citizens can have greater involvement in the foreign policy debate of their country. Our relations in Congress open the doors to Latin American civil association activists and allow them to to contribute their own perspectives to the debate on US policy. The Education Fund of the Working Group for Latin American Affairs faciliates international support for human rights defenders in the region. Our collaboration with the human rights organizations in the region ensures that our work answers to the needs of Latin American allies and and to the values of coalition members. 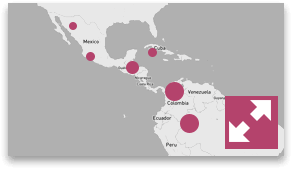 Our work with CAMMINA focuses on the creation of regional allies and strategic information to protect the human rights of migrants in Mexico and Central America under the new United States administration. It aspires to Mexican and Central American civil society organizations having technical and specialist information on immigration and foreign policy in the United States and its impact on migrants and minority populations to mitigate or prevent detrimental effects and impacts on human rights. It also wishes for technical working groups to be maintained and the dialogue with local and government actors of the United States, such as the work group of NGOs, Customs and Border Patrol and Congress, to allow the exchange of information about the situation in countries of origin and monitor existing programs and agreements for the protection of migrants’ rights. LAWG is a key player in setting US policy with Cuba on a path towards the normalization of relations. Our collective efforts achieved the lifting of the embargo on the sale of food and medicine to Cuba and easing restrictions on the right of US citizens to travel to the island. We played a major role in shifting US support for war to peace in Colombia; we ensured congressional scrutiny of human rights abuses in Colombia and changed the balance of aid from military to social. We achieved greater transparency in US military aid programs both in the western hemisphere and worldwide with our allies CIP and WOLA through our monitoring of aid. We helped open dialogue with US Customs and Border Protection to improve respect for the rights of migrants and border communities. We succeeded in inserting human rights into US diplomacy with Colombia, Mexico, Honduras and Guatemala and helped to secure the inclusion of important human rights conditions in US security aid to hold countries accountable to provide justice for human rights violations. We helped to secure major aid packages following devastating hurricanes and earthquakes in Central America and Haiti. In the 1980s and 1990s, we led efforts to shift US policy from war to peace in Central America, support the implementation of historic peace accords and declassify tens of thousands of US documents to assist Central America’s truth commissions.